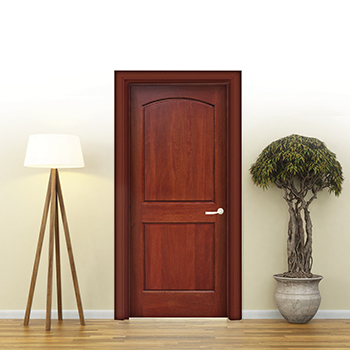 Having mahogany interior doors installed in your residence can make your home a more warm and inviting place. Perfectly suited to homes with traditional or colonial types of décor, these doors feature a natural elegance that is at once bold and timeless. However, when it comes to doors made of solid wood, achieving the classic look that so many homeowners love requires the highest quality of craftsmanship. At Main Door Corporation, we take immense pride in the workmanship and attention to detail that goes into every one of the mahogany interior doors that we create. Unlike many of our competitors, all of our doors are made out of solid wood with no veneers, so they feature rich, natural wood grains that make each one unique. Plus, a solid wood construction is exceptionally durable, and won’t be subject to peeling and delaminating like veneered options. Additionally, when you buy a mahogany door from Main Door, you can rest assured that all of the materials were sourced responsibly. We follow the strictest guidelines for proper forest management and are certified by the Rainforest Alliance and Forest Stewardship Council™ (FSC). If you’d like to learn more about our Mahogany interior doors, contact Main Door Corporation today. Or, you can simply visit your nearest Home Depot store and see our products first hand.